Coal is more abundant and cheaper than oil and natural gas, but it exhausts high carbon dioxide gas (CO2) and sulfur content of the environment load at the time of the use. Clean coal technology (CCT), which uses coal in high efficiency and clean, is a key technology to reduce the discharge of the material having high environmental load. Especially since the coal gasification process provides higher energy efficiency in CCT, it is expected to be more widely used for a power generation and chemical raw material production. Coal Gasification related Technology of Chiyoda has the following characteristics. Chiyoda offers optimal systems to suit client's needs. Chiyoda offers plant technology to maximize coal use efficiency and minimize environmental impact in various plants that use coal-gasified synthetic gases by applying our many experiences of gas purification and conversion facility costructions, which we gained in projects of petroleum and natural gas. Chiyoda has abundant experiences and technologies in a field of chemical plant construction. Chiyoda offers most suitable process to produce chemical raw materials from syngas produced by coal gasification. 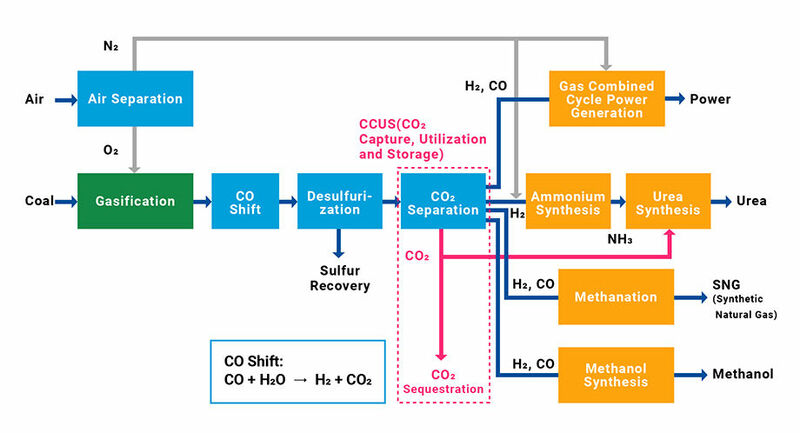 Chiyoda is available for CCUS (CO2 Capture, Utilization and Storage) facilities construction for global warming countermeasure, since we have many experiences of design and construction of carbon dioxide gas capture facility for natural gas purification. Coal gasification is suitable for environment-conscious electric power generation and production of chemical raw materials from cheap low grade coal (sub-bituminous coal, brown-coal) . Chiyoda has carried out many feasibility studies of electric power generation and production of chemical raw materials, such as synthetic natural gas, urea, and methanol by coal gasification until now.